The Other Side blog: A to Z of Adventure! X is for Expert. This is not some attempt to grift the Challenge. The Expert Set adventures were given the code X. Of course, the most famous of these is X1, The Isle of Dread. I got this adventure along with my Expert set back in the early 80s. It is an obvious King Kong homage, but it is a great one. It is another one of those adventures that people keep coming back to time and time again. Maybe second only to B2 and B1 in terms of numbers of players, but The Isle of Dread is one of the best Basic-era adventures out there. In today's frame of mind the adventure is equal parts Pirates of the Caribean, King Kong, and Jurassic Park. It is a heady cauldron of tropes, ideas and just plain crazy fun. It was included in the original Expert set and it still had expanded maps and more creatures. I never understood why the creatures where not just in the main book, but it did make the module special. What was so nice about X1 over B2 is you had the feel it was more integrated into the Expert rules; it felt like a logical extension. 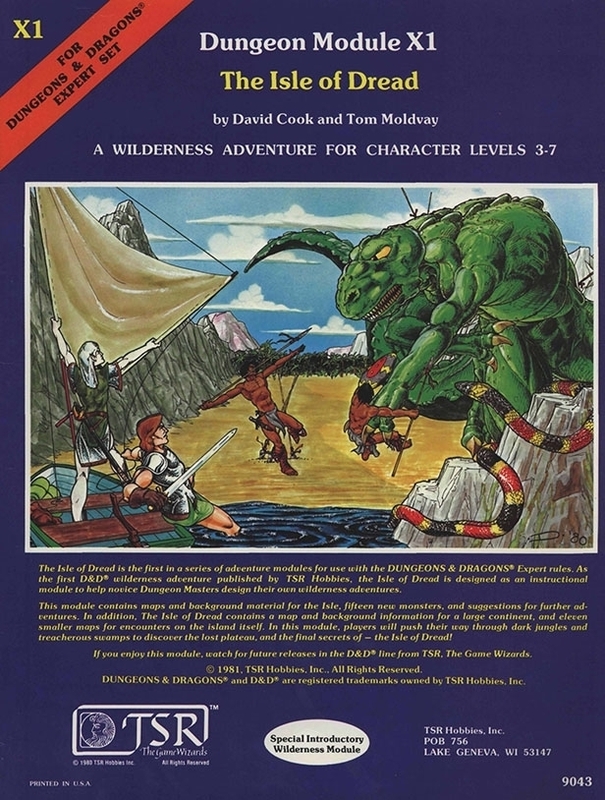 This is also the first published adventure I ever ran for my son. Up to this point I had ran ones I had made up for him. He was young (6 or 7) and adventures like "Cave of the Stinky Goblin" or "Trouble in West Haven" were more appropriate for him. But X1 had the great big dinosaur on it and he loved dinosaurs. We had a blast. To me, 20 some odd years later, it felt like a very different adventure. There is a lot of untapped potential here. Enough for several adventures really. Later on I bought my son his own copy to run sometime. It was also the first time that my kids began to recognize Tom Moldvay's name on the covers of adventures. Another one of my "holy grail" items. I managed to score a copy when I moved to Chicago. There is so much to love about this adventure, but I have detailed it all before in these pages. and I explore the Castle Amber / Ravenloft connection here. Again, this is another Tom Moldvay adventure and we all loved it. The other X modules came out a bit later and were more tied to the newer Frank Mentzer-edited Expert Set, as opposed to the Cook-Marsh-edited set I had owned. (I guess these modules should have really been called "E" for expert then). Of these I only later owned Quagmire. I got it cheap at a used book store in Carbondale, IL. I completely gutted the module and only kept the tower and swamp. In particular, I would like to get print copies of X4 and X5 for my Second Campaign game. Saga of the Shadow Lord also sounds like a lot of fun! This is my problem...too many great games/adventures and so little time. I have so much love for the X series but yeah, Isle of Dread is one of the greats. I will say that that even as a kid I laughed at the cover because the boat the adventurers use is terribly small for the ocean you have to cross to get there. I've blogged about X4 and X5 (some years ago) though I've never had the opportunity to run them...very, very cool. *sigh* I don't know. I probably just have to give it another shot. X1 was VERY different for me running it now versus back in the early 80s. I guess for me it was more of a sandbox now than it ever used to be. Go there, get back to the ship, explore the coasts. I'll look for your X4 and X5 posts. "This is my problem...too many great games/adventures and so little time." Truer words have never been...well, you know. I've begun to wonder if the pleasure of reading an adventure should be on the mind of the writer as much as the pleasure of playing it. It seems that there are many of us for whom the reading is as far as we're able to get with a majority of the material we enjoy! I have Isle of Dread and Castle Amber, but I've never ran either. I could definitely see why Castle Amber interests you though. I'll have to work it into a game. Isle of Dread is one the only TSR module that I own. I hope to run it one day.